"The problem with these ideas is that, according to rumors, there isn't any additional energetic particles in the diphoton events." Would it be fair to say that if it's spin-2 it's not the graviton because it's way too massive, though it would have some gravity-like effect, albeit at much shorter distance than gravity? "Such at least are some of the thoughts summoned by _Ficciones_; the variants are numberless..."
Anon 4:12, apart from the mass there may be important differences between the hypothetical spin-2 particle and the usual massless graviton that mediate gravity. In particular, the couplings of the spin-2 guy to matter do not have to be universal, unlike for the massless graviton in the Einstein gravity. Nevertheless, we usually just call it a "massive graviton". Jester, but what would the ramifications be of finding such a thing? I know there are various multiple-Higgs models, are there any multiple graviton (or multiple spin-2) models? Previously from what I'd read about theoretical investigations into the possibility of gravitons with mass I'd got the impression that they would still need to have a very small mass to work properly, as fields with quanta of large mass would be short distance. This would suggest you'd still need another graviton particle. Models with extra dimensions of spacetime provide a consistent realization of a tower of massive gravitons on top of the massless one. 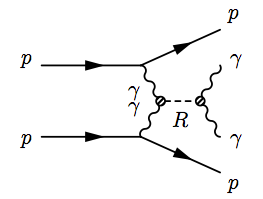 How does emission of soft photons change the (Landau) statement about an integer spin of the decaying something? I don't think Landau-Yang forbids J>2 odd. J>2 does imply orbital angular momentum though. Thanks, indeed i'm not sure about J>2 odd so i need to check this. In the meantime i will modify the statement. Vladimir: Landau-Yang refers only to 2-body decays. Unfortunately, this loophole is of no use for the diphoton final state (no emission possible at leading order). The Landau-Yang (LY) theorem forbids the decay of a massive spin 1 particle into a pair of massless on-shell photons. The "everyone's model" that Jester is alluding to must also comply with the LY theorem as applied to vector-like quarks, unless some other mechanism comes into play. Jester, Leading order is not correct just because it lacks soft photons. We should speak of the exact theory result rather than of the "leading order". 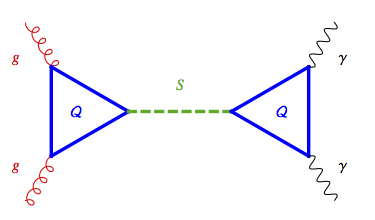 A large width means a short lifetime and a small branching fraction to photons. So where are all the other decays and the corresponding effects in precision experiments? If those decays are to invisible particles, that could work. There's no strict implication, just plausible arguments. A large decay width must come from decays into something, however decays to SM particles are constrained by experiment. So the decays should be into some exotic particles. These exotics must be strongly coupled to the 750 GeV resonance (as you notice), however they must be weakly coupled to the SM particles otherwise they would have been seen already. "In particular, the couplings of the spin-2 guy to matter do not have to be universal, unlike for the massless graviton in the Einstein gravity. Nevertheless, we usually just call it a "massive graviton"." Is there any chance of stopping this intensely noxious terminology from becoming standard? If it doesn't couple universally then it isn't a graviton. Why not call it a massive photon, that would be just as stupid and no more misleading in the long run --- after all, wrong spin, wrong couplings, who cares? Calling this thing a massive graviton will just encourage the people who have generated a vast number of foolish papers on that topic. Even worse, what if the popular press hears about a possible "massive graviton"? Admin note: please keep comments on topic. If you have a comment about authors of any paper, try to contact them directly. It must be a stupid question but if true graviton couples universally how do we get photon, gluons and massless particles in general? The graviton, photon, weak boson and gluon are all integer spin particles that arise as a result of certain symmetries exhibited by physical theories. It is customary to refer to them as “force carriers”. For example, the graviton emerges by demanding invariance of the theory to arbitrary changes of spacetime coordinates. As hypothetical quantum of the gravitational field, the graviton is massless and couples to everything that has energy (mass). Likewise, photons, weak bosons and gluons arise as “gauge bosons” by demanding that the theory stays unchanged under local gauge transformations. These transformations are at the core of the principle of local gauge invariance. Local gauge invariance constrains all “force carriers” to stay massless. In the Standard Model of elementary particles, the Higgs mechanism enables the weak bosons to acquire mass while leaving the photon massless. You are right Ervin, thank you! It's mass vs energy terminology that confused me. 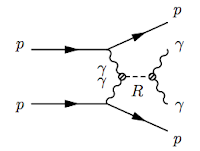 A photon has zero rest mass but still couples to gravity because it carries energy. "Even worse, what if the popular press hears about a possible "massive graviton"?" That would actually be good, because hype in the pop sci press nowadays only serves to discredit the idea in question. Still trying to grasp this notion of "universal coupling": so let's say we managed to accelerate a mass particle like electron to near light speed. It's gotten huge mass, sends tons of massless gravitons, bends space around like crazy and eventually maybe, breaks it apart (somewhere around Planck's mass). That's fine. But to get it to this situation we'll have to send it extremely (and more and more) energetic photons, right? But the photon itself would have to couple to gravitons then, so even before getting to the electron it'll do all the havoc above. Is that right? Would an extremely energetic photon bend space time around it (like reverse gravity lens)? Can we hope to detect these space time distortions when energetic photons pass by? The mass of the electron is unchanged. Where "mass" is used in the way all physicists used it in the last decades. There is a concept of relativistic mass - just forget it. The energy increases with speed, the mass does not. "bends space around like crazy and eventually maybe, breaks it apart (somewhere around Planck's mass)" - no. And that misconception is one of the reasons relativistic mass is not used any more. "Would an extremely energetic photon bend space time around it (like reverse gravity lens)?" - every photon does so, but the effect is some tens orders of magnitude too weak to measure it. The Bayesian posteriror estimate on what sort of physics we are looking at goes like this: As you increase the physical width of the resonance, the plausible models (assuming this isn't a side by side mis-trigger) goes from generic to plausible to weird and ends up somewhere in never never land. I am not the owner of this blog but your comments are clearly off topic. I suggest you raise these questions elsewhere, at Quora or Physics Stack Exchange. The short answer is yes, all photons carry energy and distort spacetime, but this distortion is truly negligible even for ultra high energy cosmic rays where the kinetic energies are typically greater than 10^18 eV. Merely accelerating an electron to near light speed will do nothing interesting. Look at an electron at rest in the lab - there exists a (Lorentz-boosted) reference frame in which this electron has total energy near (or even greater than) the Planck energy. But it doesn't collapse into a black hole, spacetime doesn't "break apart", nothing really happens. If you want to see gravitational effects, you need huge energy density, but in the center-of-mass reference frame, not in an arbitrary one. What about mini/micro black hole generation and subsequent evaporation? Did anyone exclude this possibility? @Anonymous: They should not have a narrow mass - after some threshold (let's say 750 GeV) they should be produced up to several TeV. Anything that starts at 750 GeV would leave a massive signal at TeV energies. I'll be excited in 4 days. Either by a discovery, or by the amount of unsubstantiated rumor. If the numbers in circulation are right (3 solar masses emitted as gravitational waves), the emitted power of gravitational waves towards the end should be the most powerful thing we saw in the universe so far, some large multiple of 10^46 W.
Yes, im of course aware of this, and I'm as excited as everybody. But I know very little about the topic, so I'm not sure if i can add to the discussion.